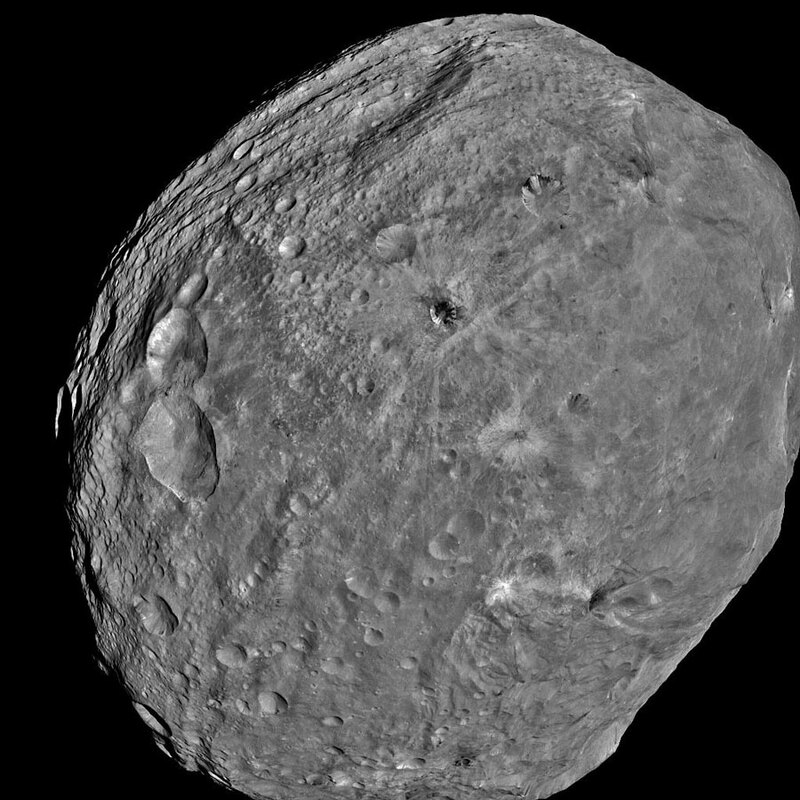 Vesta is one of the larger asteroids in the asteroid belt. It is the third largest (about 500 kilometers wide), but the second most massive (after Ceres). It is also the only large asteroid for which we have high resolution data, when the Dawn spacecraft orbited it for a while in 2012. You can see a view of Vesta in the image below. Since we know something of the chemical composition of Vesta, we can compare that with the composition of various meteorites. From this comparison we have identified about 1200 meteorites that are likely to have originated from Vesta. From the variety of these meteorites we know that Vesta is differentiated, with an iron-nickel core, magnesium rich mantle, and rocky crust. Given its size and composition, it likely had a molten core and mantle for the first few million years of its existence. One of the striking features of Vesta is its surface brightness. Vesta is the brightest major asteroid, and this seems to be due to its basaltic crust. Still, its brightness has been a bit of a mystery, because interactions with the solar wind would tend to darken the surface over time. But this would be mitigated if Vesta had a magnetic field. Unfortunately, the Dawn probe doesn’t have a magnetometer, so it can’t detect whether Vesta has a magnetic field. But Vesta observations do indicate that the core of Vesta is about 200 kilometers wide, which does reinforce the idea that Vesta once had a melted core. With a melted core, it would be possible for Vesta to have had a magnetic dynamo within its core. A dynamo occurs when a melted iron core undergoes rotation and convection. The motion of the conductive metal generates a strong magnetic field. The melted iron core of the Earth maintains our planet’s strong magnetic field, which helps to shield us from cosmic rays and solar flares. In contrast, Venus does not have such a dynamo, and its magnetic field is significantly weaker. Mars also lacks a dynamo, and has a weak magnetic field. One of the mysteries about Vesta and other planetoids is whether it is possible for something so small to have had a magnetic dynamo in its youth. Evidence of Vesta’s large iron core suggests that it might have been possible, and now a paper in Science (paywalled, but a free pdf is available from the authors) strengthens that idea. The authors looked at a particular Vesta meteorite, and found it had a remnant magnetic field. From the strength of this field they gauged that when the meteorite was still part of Vesta, the asteroid had a magnetic field between 2 and 10 microteslas. By comparison, Earth’s current magnetic field is about 30 – 60 microteslas. They also looked at argon isotopes from the meteorite, and determined its age to be about 3.7 billion years old. This doesn’t mean that Vesta still had a strong magnetic field at that time. Vesta formed about 4.5 billion years ago, so 900 million years later any dynamo would have likely cooled and faded. The magnetic imprint on this particular asteroid is a secondary effect. The early dynamo would leave a strong imprint within the crust as it formed, and when chunks of the crust were scattered due to an impact, the magnetic imprint of the fragments imprinted a lesser magnetic field on the resulting meteorite. So it seems likely that Vesta had a dynamo core in its youth. But to be sure we’d need to look at the magnetic field of its current crust. Hopefully that will be planned for a future mission. 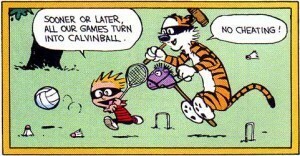 Paper: Fu RR, Weiss BP, Shuster DL, et al. An ancient core dynamo in asteroid Vesta. Science. 2012;338(6104):238-41.